A writer named Joe Wallace often visits the Hall of Fame to do research for his latest baseball book. Whenever I see Joe, I make sure to say, “Hey, Tarzan.” It’s an inside joke between the two of us, one that always draws a chuckle from Joe. More to the point, it’s a way of paying homage to a colorful ballplayer who has a similar name—and that same unwanted nickname. Without question, the 1970s provided a great backdrop for creative nicknames. One of the best was indeed “Tarzan”—a reference to the popular title character of several black-and-white films from the forties and fifties—which was given to journeyman outfielder Joe Wallis. The former Chicago Cubs and Oakland A’s flychaser was a good fielder with some speed, but never did much offensively during a five-year career in the late 1970s. While the switch-hitting Wallis made little news with his on-field play, he managed to garner a reputation as one of the game’s more unusual characters. Wallis earned the Tarzan label because of his willingness and ability to dive off of cliffs. One of his college press releases indicated that his “favorite pastime is taking dives off 100-foot cliffs into rock-filled quarries.” I mean, who wouldn’t name that as his favorite pastime? As a professional ballplayer, Wallis added to his repertoire by jumping out of motel and hotel windows, landing him directly in each facility’s swimming pool. His key to executing such dives? “Make sure you clear the cement,” Wallis told Tom Weir of The Sporting News. Good advice indeed. One of Wallis’ teammates with the Cubs, veteran right-hander Ray Burris, recalls Tarzan for being reckless and daring in other ways. “Joe was kind of—oh, what’s the word I want to use?—high-strung,” says Burris, who now works as a minor league pitching coach. “He rode motorcycles in the wintertime on icy roads in Chicago. He had a wreck one year, riding the motorbike. He was a good little ballplayer. He just had that flamboyance for being a daredevil. I called him ‘Evel Knievel of the Cubs’ during that time.” Wallis became involved in two nasty motorcycle crashes, one of which took place on the night of the seventh game of the 1977 World Series. Riding across a bridge near his home, Wallis crashed into an oncoming car that was driving in the wrong lane. The crash sent the motorcycle into the river; Wallis bailed out before impact, skidded 75 yards on his back, and suffered a broken leg while losing much of the skin between his neck and his tailbone. Wallis had to wait a full two weeks for the stripped skin to grow back. Wallis eventually recovered from his injuries, but never managed to repair a fractured relationship with Cubs manager Herman Franks. During a spring training exhibition in Palm Springs, Wallis tried to catch a fly ball behind his back. The outspoken Wallis didn’t think it mattered since Franks had already left the ballpark, but apparently didn’t realize that someone would eventually tell the manager about what he did. Not surprisingly, the old-school Franks became none too pleased when he heard about Wallis’ attempt at reliving the days of the Indianapolis Clowns. The Cubs eventually traded Wallis to the Cleveland Indians, who immediately sent him packing to Charlie Finley’s circus with the A’s. 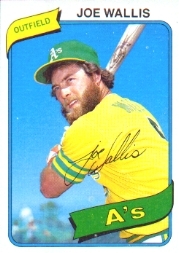 After joining the A’s in 1978, Wallis added to his offbeat persona by growing a beard; he became part of Oakland’s “Bearded Bunch”—11 players who sported such facial hair. Wallis’ outrageously thick and long beard, literally the largest of the bunch, gave him a look that might have earned him an audition for the 1970s cult classic, Deliverance. For the guy nicknamed Tarzan, that would have been a perfect piece of casting. I think I remember Wallis sometimes showing off his throwing arm; I think it was a TV game where he caught a fly in CF and threw it to 3B on the fly to hold the runner and you could hear the appreciative mumbles from the sparse crowd so it was probably a longer throw than it looked like from the 3B camera. But hitting the cutoff man might have achieved the same result. Probably a bit like Mike Davis in that regard.